I am always on the lookout for good books on Linux which covers system and network administration topics. 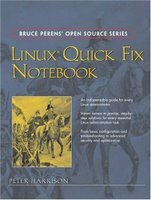 So when I came across one of the Bruce Perens' Open Source Series books on Linux called "Linux Quick Fix Notebook" authored by Peter Harrison, I gave it a shot. At first I was a bit skeptical owing to my past experiences with books that claim to be all rounders in their respective field but which in reality covers the topic in shallow depth. But after flipping through a few pages, I marvelled at the sheer amount and depth of coverage of system and network administration topics. This book positions itself as a System / Network administrator's guide to configuring and fixing various issues faced in Linux and so is a bit short on theory but more than makes it up by taking a hands-on approach in tackling these problems. It has everything from the basic configuration and trouble shooting to advanced security and optimization techniques. Linux File Server Project - which gives a sound base on the introductory networking topics like a complete chapter on subnetting IP addresses - which interestingly has not been covered in any of the Linux books I have come across so far, setting up a NIC on Linux, Simple Network Troubleshooting, three chapters on Samba, configuring a DHCP server and more. This part includes 13 chapters. Advanced Topics - This forms the third part of this book and contains 11 chapters. This part deals exclusively with those topics in networking and system administration which are niche areas. These include a chapter on network based Linux installation, how to configure RAID (Redundant Array of Inexpensive Disks), managing disk usage through quotas, configuring NFS, NIS, LDAP and RADIUS, setting up a proxy server using squid, a chapter on Virtual Private Networking, modifying the kernel parameters to improve its performance and basic MySQL configuration details. That is not all, the author has also included 4 appendices which can be considered to be chapters in their own right which covers those topics which did not fit in any other place in the book like using TCP wrappers to improve security, codes, scripts and configurations, examples of zone files for DNS configuration and so on. The author has also included a short section on Cisco routers and PIX firewalls and explains how to backup the configuration files of these hardware routers to a remote Linux server. Because the book has over 35 chapters and 4 additional apendices, I will list the essential topics covered in this book instead of a chapter-by-chapter listing. Peter Harrison, the author of this book is a principal network engineer for a major Web-hosting company with over 20 data centers throughout North America and Europe. He has worked extensively with Linux in mission critical, high availability environments used by a number of Fortune 500 companies. He was founding president of PCJAM - Jamaica's first computer user group, and was principal systems engineer responsible for computerizing the island's tax collection and social security systems. He is a Cisco Certified Internetworking Engineer (CCIE). As the name indicates, this book is truly a hands on reference for any system or network administrator dealing in Linux. Each topic is dealt with by giving practical how-to kind of examples and all the person has to do is execute the commands the same way that has been given in the book. The topics are explained in a simple and lucid manner keeping complex jargon to a minimum. The chapters have a logical flow of information starting with concise backgrounders and ending with a troubleshooting section. Each chapter is a complete entity in its own right and so it is not necessary to read the book from cover to cover. You can easily jump to the section you are interested in and carry on from there. For example, if you are interested in configuring RAID on your machine, you can directly flip to the chapter dealing in RAID (chapter 26) and start reading from there thus saving a lot of time. Configuring and setting up various packages and services is explained using command line method, which I believe is a plus point as far as the topic of system and network administration in Linux is concerned. This book addresses the real issues that systems administrators encounter when working with Linux. The only thing I found a bit of a drawback was that the author has used the Red Hat way of configuring things all through out the book. So starting and stopping services is explained using the 'chkconfig' and 'service' scripts through out the book. Installing packages is explained using 'rpm' and so on. And a person using a non Red Hat distribution will feel a bit disoriented at first. But that does not bring down the value of the book at all. Taking into consideration the sheer amount of topics covered and their depth, I can't fail to notice that it is a book worthy of being a companion to any professional system or network administrator in Linux. Excellent review. As a system and network administrator myself, I couldn't have put it in a better way. I am myself using this book for all the trouble shooting and configuration needs I encounter in my work. As far as Red Hat way of configuring is concerned, it is no problem for me because we use Red Hat enterprise server :). I would recommend this book to anyone interested in Linux system and network administration. Thanks for this review. I was on the look out for a good book on systems and network administration in Linux. I had already decided to buy one of the Linux bibles but after reading this review, I think I will buy this one instead. Hey the book is also available in pdf format at informIT site. It's a free download.